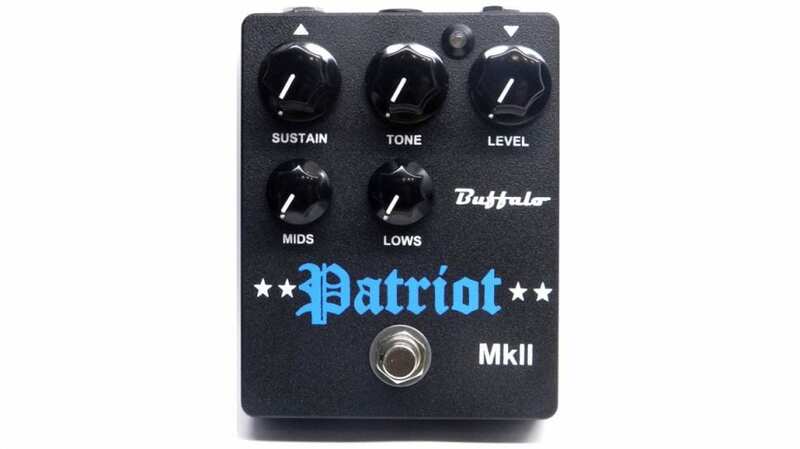 Made by Buffalo FX, the Patriot MkII fuzz pedal is a new take on the ‘Civil War’ Big Muff and adds bass-cut and mid-boost controls to a classic effect circuit. 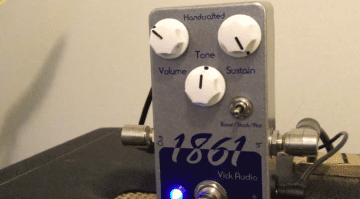 Fuzz geeks rejoice! The much-loved Electro Harmonix ‘Civil War’ Big Muff circuit has been recreated here by Buffalo FX. But it’s also been overhauled and tweaked to make it more useable. 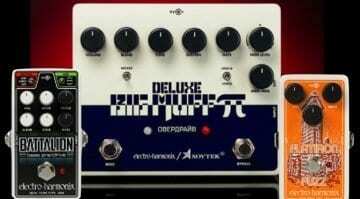 For those not sure what we mean by Civil War Big Muff, it refers to the grey and blue Russian-made Big Muff pedals of the early ’90s, named by collectors after the colours of the two sides of the American Civil War. You can read my recent article on the Electro Harmonix Sovtek Deluxe Big Muff Pi release, which is EHX’s take on its own circuit. This new Buffalo FX Patriot MkII fuzz pedal adds a bass-cut and mid-boost control, which is very handy. The original units from Electro Harmonix can be heavy on the bass frequencies and also squash the mids, in turn making your fuzz sound disappear in many band situations. 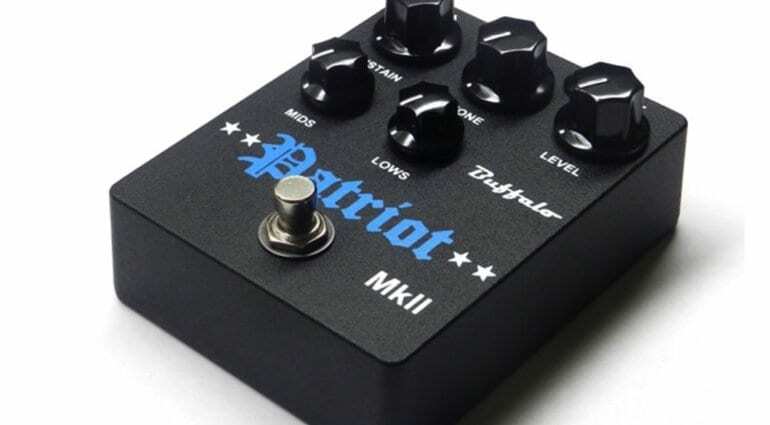 The Patriot MkII has controls for Drive, Level, Tone, Bass-cut and Mid-boost. Rather than a mass-produced fuzz pedal made with Soviet-era components on a budget, the Patriot MkII uses Russian NOS clipping diodes, low-noise metal film resistors and through-hole components. 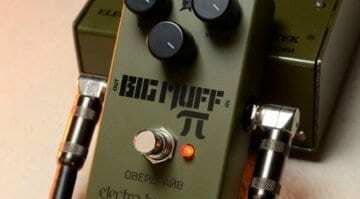 The list of component suppliers includes MMK, Wima, Epcos, Vishay and Panasonic making it a more refined take on the classic Big Muff fuzz pedal. It also includes a dim-able LED so it doesn’t blind you mid-gig when you engage the fuzz! Yes, it is true-bypass and it also has top mounted input/output jacks all, so it’s well suited for use on a pedalboard. The price is also way cheaper than trying to find an original old Russian Big Muff on the used market. Many players also associate this tone with David Gilmour’s guitar tone on the Pink Floyd Pulse era recordings. The official webpage for this effect talks up this aspect, including an quote from Bjorn Riis of the Gilourish fan site: “This is as close as you’ll ever get to the Civil War Big Muff and David’s lead tones on PULSE”. Make of that what you will. Because of this association, prices of original pedals have skyrocketed in recent years. But you could always buy yourself one of Gilmour’s original guitars and really chase his tone! 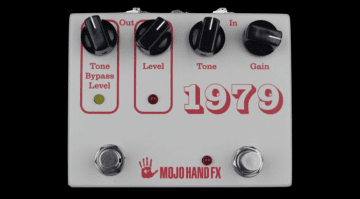 1979 fuzz by Mojo Hand Fx: A late 70s Big Muff you can rely on?